Waiting to Burn is a collection of poems. One of three winners of the Templar Poetry Prize in 2006, Angela Cleland has written a collection full of beautiful memories and reminiscences. Drawing on classics - there's a smattering of Zeno, Hermes, Eurydice and Orpheus - and contemporary snapshots, she creates pure moments of longing and reflection. She takes the mundane - clothes dumped on the floor, a light - and turns them into startling insights. 'Cardigans' and 'Electricity' are wonderful. 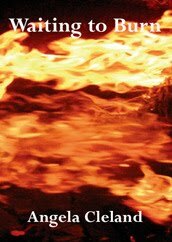 The title poem, 'Waiting to Burn' (in eight parts) is a tour de force of insight into patience, witches and waiting.